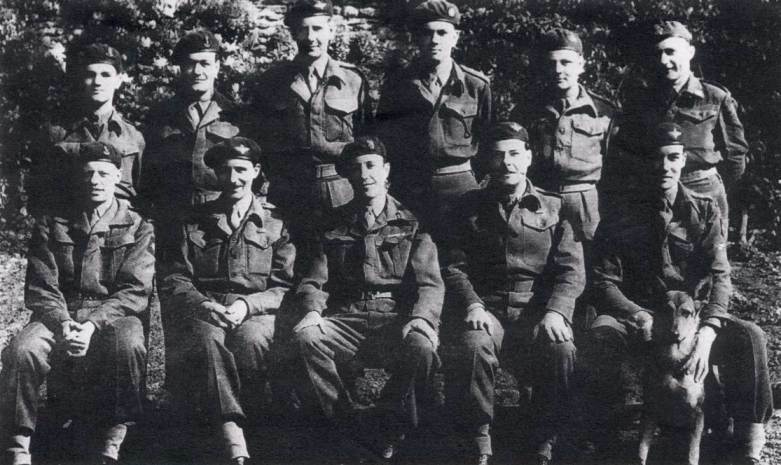 John Fitch (front row, second from the left) as a Major with the 1st Para Brigade HQ in May 1944. Back row, left to right: Captain W. A. Taylor, Lieutenant S. G. Cairns, Lieutenant Pat Barnett, Captain R. E. Morton, Captain C. R. Miller, 2nd Lieutenant J. Szegda. Front row, left to right: Captain W. J. Marquand, Major John Fitch, Brigadier Gerald Lathbury, Major C. D. Byng-Maddick, and Captain B. W. Briggs.